Having an energy efficient home can save you hundreds or even thousands of dollars a year. At Regent Homes, we are dedicated to providing you with the highest quality homes and that means making your home as energy efficient as possible. We do this by using an industry standard scale known as the Home Energy Rating System (HERS) Index. With an average HERS rating of 58, the HERS index predicts that Regent Homes can save you an average of $1,257 annually*. The U.S. Department of Energy estimates that a resale home scores around 130 on the HERS Index while a new home typically receives a rating of 100. 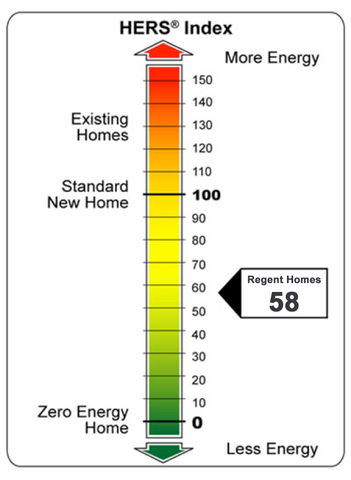 Regent Homes far surpasses these standards by building homes at a rating of 58 on average. We aim to provide you not only beautiful and unique craftsmanship, but an energy optimized home for you to love and enjoy for years to come. Call us today to find out more or to start planning your new Regent Home! *The information presented for educational purposes only. Savings are average estimates for single family homes in the U.S. developed by the National Renewable Energy Laboratory. Savings will vary based on house type, orientation, house size, utility rates, climate and operation of the home. For specific information on a home please have a home energy rating conducted by a certified RESNET Home Energy Rater. Annual energy costs and annual savings are estimations based on the calculated HERS® Index per this floor plan versus a RESNET standard for resale homes (130). The HERS® Index follows RESNET standards for certified 3rd party raters to follow.